Many schools have asked for a very specific type of transcript, where the quarter grades are averaged into a semester grade. GPA and credit are awarded by semester as well (not by quarter). And the transcript only shows grades for the 2 semesters each academic year (and not for each quarter). 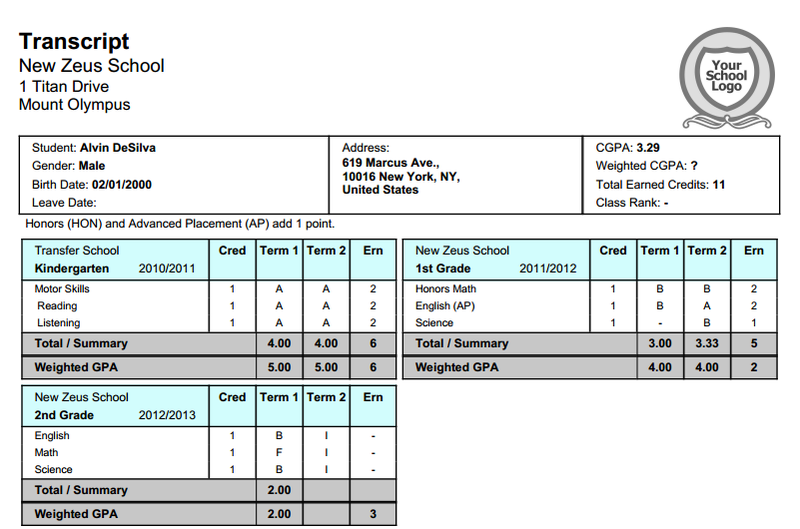 Notice that this template also supports the Weighted GPA discussed in a previous article. This template assumes that you have 4 quarters set up per year (and not 2 semesters). Each quarter will have its own gradebook, and the system will average the final grade for 2 quarters to get the semester grade. 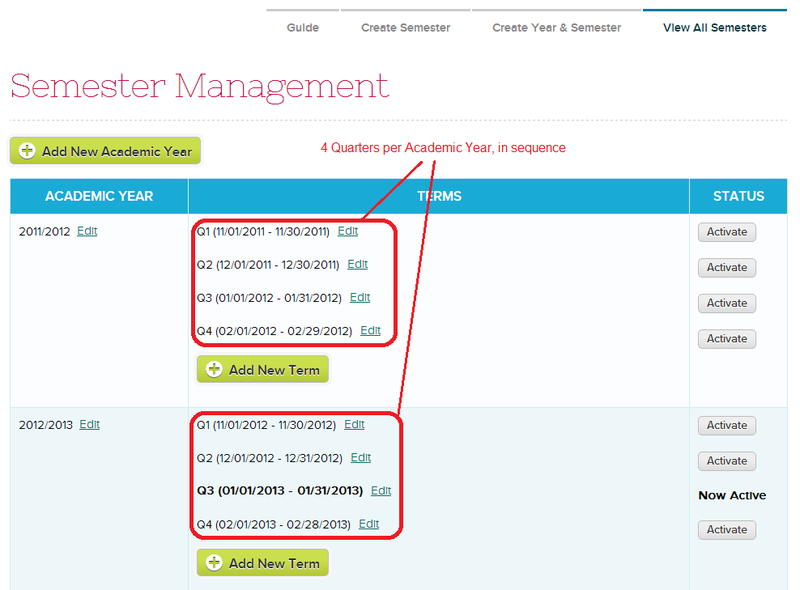 Make sure the academic terms are in sequence, based on the start and end dates of the term. You will need to select “Year-based” for this to work. The system will then group the first 2, and the last 2 quarters configured under “View All Semesters” to calculate the semester grade. Go ahead and select the “Consolidated 2-Column Transcript” template, and configure/customize the parameters to your liking. 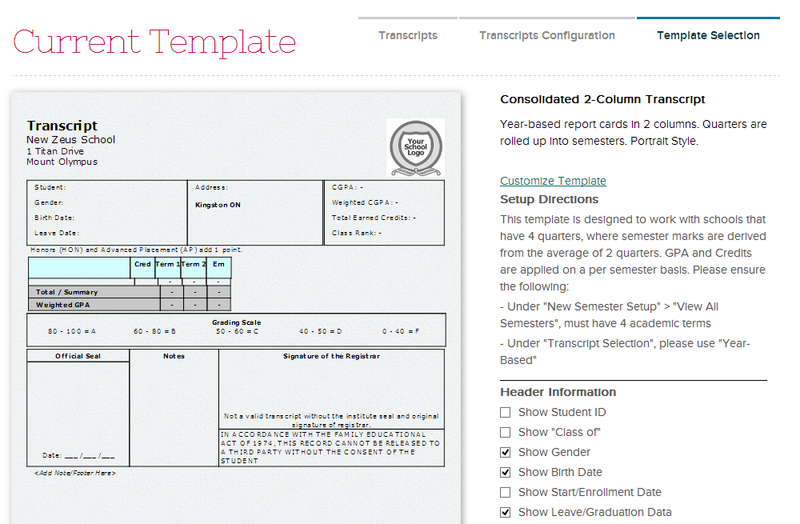 When you’re done, you can go to “Transcripts” > “Transcripts” and view a transcript record for a student. The completed format should be similar to the one we showed above. Good luck. And as always, if you need help, come chat with us!